The French are known for many things but perhaps the Fleur de Lis is the one thing that has remained with France’s identity for so many years. Fleur de Lis accents are originally from the French countryside. Although these simple and artistic metal pieces started off with religious connotations, they have evolved to become important décor options for homes all around the world. Fleur de Lis wall décor is designed to add character and class to your walls. The décor has retained its distinct lily flower shape but there are many twists in design that you can explore these days. As you start shopping for the perfect Fleur de Lis wall décor, you may want to keep in mind a few things. First, size is quite important. Fleur de Lis wall décor designs come in different sizes. Largely sized designs that are big enough to cover a big portion of the wall are very common. They are much more visible and their aura is easily appreciated. But small designs aren’t bad either, especially if you’re simply looking to accentuate an otherwise dull wall with a few classy decorations. Either way, you need to make sure that the Fleur de Lis wall décor is proportionate to the wall. Don’t go for something too big because it may end up looking cluttered. Make sure you also consider the type of finish. Fleur de Lis wall décor finishes may range from gold, bronze, gray, and many other colors. Some designs are also polished to give you a livelier look. Before you buy any design, think for a moment how its finish will rhyme with the colors on your wall. The hanging mechanism is also another crucial consideration. You want a Fleur de Lis wall décor design that takes just a few minutes to hang. In addition to this, the hanging mechanism should also be strong enough to ensure the Fleur de Lis remains in place once installed. Large designs, in particular, can pose a significant degree of danger if they are not hanged well. Finally, always make sure you have analyzed as many designs as possible. Most people make the mistake of buying whatever they can find as soon as they find it. If you really want class and style you will need to look a little bit longer by sampling as many designs as possible before choosing the right option. The following is a list of ten high-quality Fleur de Lis wall décors that can be used to revamp any home. 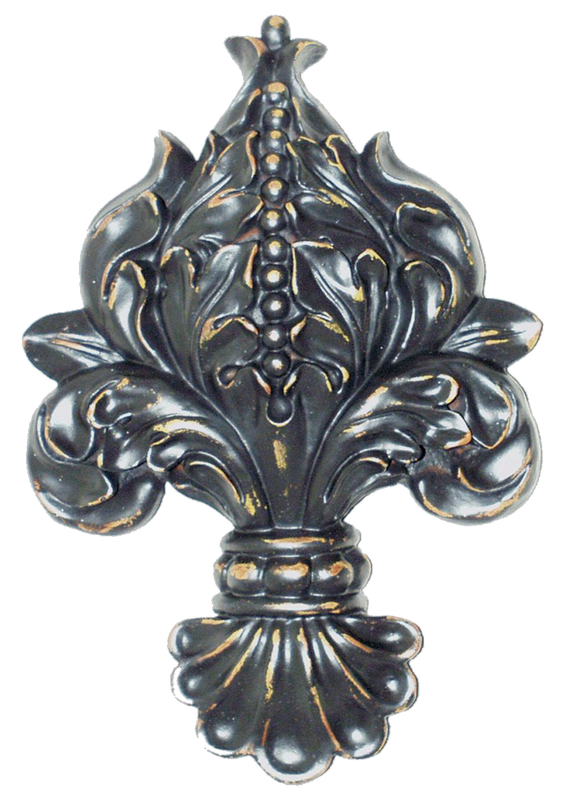 This Hickory Manor Fleur De Lis Wall Décor features a polished black finish with a unique ornamental design. The décor has a classical feel to it, and the overall design is inspired by breathtaking antique. The authenticity, class, and overall appeal of this piece will blow everyone away. It’s perfect for your dining or living room walls. This simple Fleur de Lis is made using 100% iron. The mounting mechanism is also simple and innovative. It can be hanged and removed very easily. The textured bronze finish and the unique rustic style are also important features to keep in mind. The décor is also quite huge so make sure it’s mounted on a relatively large wall. The Delight Crosses Fleur De Lis Wall Décor is a handmade design. The hand-painted resin finish complimented with a simple sawtooth hanger provides a perfect mix of design and usability. The décor also comes with a minimalist design and even though it’s not that big, it can accentuate any wall to maximum effect. This playful design is perfect for any room. At the center, the décor features a unique medallion with a round metal casing. The delightful finish makes it perfect for both indoor and outdoor use. If simplicity is what you’re looking for, then this design will not let you down. This décor is specifically made for the living room. The flair and gloss of its design are inspired by the famous potteries of Florence in the North of Italy. Handmade by master Italian artisans, the Fleur de Lis features a combination of unique patterns brought together using different colors. The décor is also medium-sized, making it ideal for any kind of wall. The Fleur de Lis Cross Wall Décor by Toscano is a timeless and elegant piece. It’s the perfect symbol of French royalty with its solid iron design and faux bronze finish. This exclusive heirloom that’s shaped like a cross represents the trinity too. It measures about a foot and half and its artistic splendor will easily dazzle anyone. This intricate and unique starburst decoration is the perfect accent for your wall. The design is nautically inspired with a touch of European décor. The design features about eight spokes that beautifully project from the center. The layout is perfectly balanced too. Whether you are looking for stylish opulence or vintage European inspiration, this décor will really do. This cool accent is, first of all, quite huge. Its impact on the walls is easily noticed. The design features simple heart-shaped scrolls with a few other French-inspired designs. The décor is also simplistic in nature and can be used for bright bare walls to add an exotic finish and outstanding character to all the rooms. This traditional accent brings contemporary flair and elegance to all your decoration. It’s perfectly sized with its intricate scrollwork finished with a shiny central medallion. The aesthetic appeal is so strong that you will only need one piece for the entire room. The décor can be used for the living room and the dining room too. These Three posts Sign Wall Décor are all about filling your home with great positive vibes. The metal wall art comes displaying three important words – “Live”, “Laugh”, and “Love”. It’s the perfect inspiration to keep you going regardless of your troubles. Nonetheless, it will definitely revamp your walls.